The first event under BGF’s new MEP was the Communication and Bonding Workshop successfully held on 10 June 2018 with the targeted number of 15 couples attending. 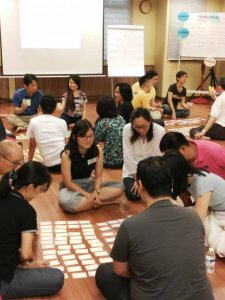 The workshop was designed to provide couples with practical tools, tips and approaches to strengthen their relationships. 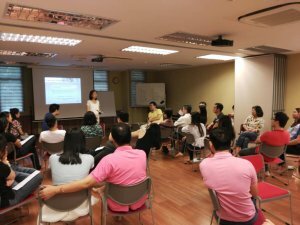 The 3-hour morning session with Ms Choy Boon Ling, a corporate trainer, focused on demystifying the building blocks to foster loving and compassionate communication and connection between couples. Ms Choy was assisted by volunteer facilitators, many of whom were from the BGFCU. 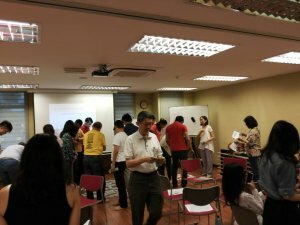 The first ice-breaking activity saw everyone exploring and sharing their present feelings and needs/values in smaller groups. This was followed by a role-play session to help participants identify 7 common patterns of ineffective communication (e.g. expressing pity, giving of advice). The highlight of the session was learning and experiencing the Communicate to Connect Model which advocates honest communication of four components to promote greater understanding and empathy: one’s neutral observations, feelings, needs/values and request. It challenges the old perception that a person’s feelings arise from a particular situation. Instead one’s internal human needs/values at any given moment determines one’s experience of feelings. We had lots of fun and laughter learning to differentiate evaluations from observations and playing “Empathy Poker” which involved taking turns to guess the underlying feelings and needs behind statements/judgments made by other participants. After a delicious vegetarian lunch, we had another 3-hour session in the afternoon on Closeness and Bonding with Ms Ivy Tan, a counseling psychologist. The overarching theme of the session was the importance for couples to foster, embrace and celebrate not only their togetherness as a unit but also their separate identities and selves. 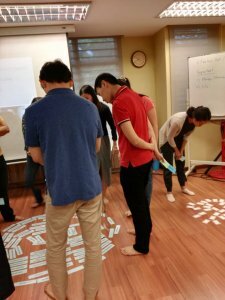 It started with a group activity where the men discussed their individuality and uniqueness followed by the women sharing their observations of their partner’s discussion. 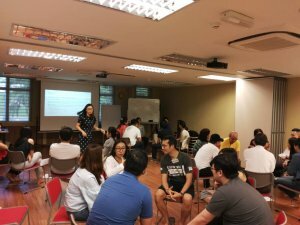 Ms Tan briefly shared the 3 main attachment styles to help couples understand their partners better. Each couple discussed what time apart and time together looks like to each other. Couples then discussed in smaller groups about the 4 broad categories of intimacy (i.e. experiential, emotional, cognitive/intellectual and sexual). What followed was an open and enthusiastic exchange of views and experiences and the roaring laughter of the participants could even be heard by the BGFCU volunteers outside the hall! The day ended with couples exchanging answers to 7 deeply personal questions (e.g. when was the last time you cried, and why?) and then staring into each other’s eyes in silence for 2 minutes. This was meant to foster an immediate sense of closeness, and for me personally, the staring portion of the final exercise invoked strong emotions.